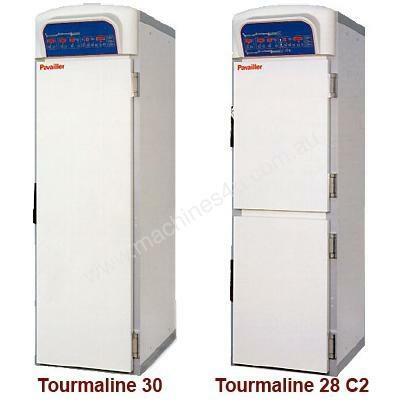 •TOURMALINE is a comprehensive range of retarder proofer cabinets, designed for 400x800 [16 x 29 inch] and 400x600 baking trays. •Each model is delivered with a humidity generator and an hygrometer as a standard. •TOURMALINE prover range are designed for bakery and pastry applications, excluding all other type of uses. •With a retarder proofer cabinet, the baker is able to manage the main proofing stages for bread production. A cold retarding cycle can be pre-set in order to slow down the yeast effects. Return to the proofing temperature is automatic at the preset time. •The equipment will help the baker to improve his working organisation. Due to a better availability of products according to customers demand, labour cost and products waste drops dramatically.